CVViZ’s automated candidate sourcing can source unfindable candidates from the web, job boards, specialized social platforms like GitHub, StackOverflow, etc. It can discover resumes from your candidate database. With API integration it can also source candidates from your career page, job boards and from social media platforms like LinkedIn, Facebook, etc. If you ever wondered how to source candidates without using job portals or you may have even tried all leading job boards but still failed to find candidates especially for niche skills then CVViZ can help you in finding candidates across the web. You just need to upload job details and we will find candidates from various platforms for you. Be it technical jobs or accounting jobs, we can find candidates for various industries and roles. You will get candidates resumes, emails and phone numbers using automated candidate sourcing. Just upload a job description for given job position and you are done. Basically mention basic things like skills, job location, etc. We search the web for you and get you most suitable candidates. We also help you in integrating you career page, job boards, social media platforms for automated candidate sourcing. Our NLP, Machine Learning powered AI resume screening & matching algorithm identifies the best candidates for you so that you engage only the right candidates for the job. Quickly reach out to candidates using SMS, personalized emails. It’s time you sit back and relax. We search the whole web in real time to find best candidates for you. These kind of passive candidates are not easily available on job boards. We automatically search & source these candidates for you. 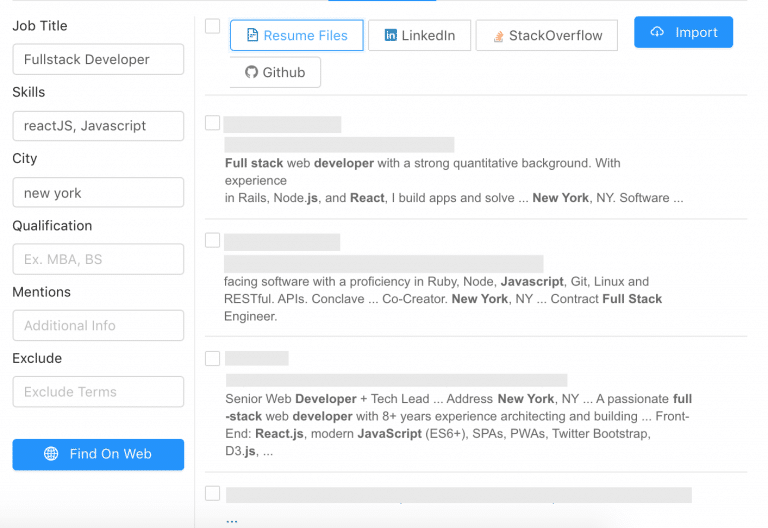 If you are looking for candidates with niche skills then platforms like GitHub, Stackoverflow, Behance are great source of high quality candidates. We identify candidates from such platforms and get you connected with them. Social media platforms like LinkedIn, Facebook are the most active places where most candidates get to know about various job opportunities. CVViZ helps you reach both active and passive candidates on social media. Automated resume sourcing helps you receive applications from interested candidates. This probably is the best and quickest way to market your job position. Our AI Matching & Ranking algorithm identifies right candidate for the right job. CVViZ automatically discovers best candidates from your candidate database and can automatically engage them using emails and SMS. There might be piles of resumes sitting in your Inbox. Or you might even call applications over your email. CVViZ can automatically fetch resumes out of your Inbox and add it to your candidate database. CVViZ help you source candidates by integrating with various job boards, career pages, etc. We make sure our integration will help you list for Google For Jobs too.